An alleged "thought photograph" obtained by Tomokichi Fukurai. Thoughtography, also called projected thermography, psychic photography, nengraphy, and nensha (Japanese: 念写), is the claimed ability to "burn" images from one's mind onto surfaces such as photographic film by psychic means. While the term "thoughtography" has been in the English lexicon since 1913, the more recent term "projected thermography" is a neologism popularized in the 2002 U.S. film The Ring, a remake of the 1998 Japanese horror film Ring. Thoughtography (also known as psychic photography) first emerged in the late 19th century due to the influence of spirit photography. Thoughtography has no connection with Spiritualism, which distinguishes it from spirit photography. One of the first books to mention "psychic photography" was the book The New Photography (1896) by Arthur Brunel Chatwood. In the book Chatwood described experiments where the "image of objects on the retina of the human eye might so affect it that a photograph could be produced by looking at a sensitive plate." The book was criticized in a review in Nature. The psychical researcher Hereward Carrington in his book Modern Psychical Phenomena (1919) wrote that many psychic photographs were revealed to be fraudulent produced by substitution and manipulation of the plates, double-printing, double-exposure and chemical screens. However, Carrington also stated he believed some of the photographs to be genuine. The term "thoughtography" was first introduced at the beginning of the twentieth century by Tomokichi Fukurai. Skeptics, among them professional photographers, consider psychic photographs to be faked or the result of flaws in the camera or film, exposures, film-processing errors, lens flares, flash reflections or chemical reactions. Around 1910, during a period of interest in Spiritualism in Japan, Tomokichi Fukurai, an assistant professor of psychology at Tokyo University began pursuing parapsychology experiments using Chizuko Mifune, Ikuko Nagao, and others as subjects. Fukurai published results of experiments with Nagao that alleged she was capable of telepathically imprinting images on photo plates, which he called nensha. When journalists found irregularities, Nagao's credibility was attacked, and there was speculation that her later illness and death was caused by distress over criticism. In 1913, Fukurai published Clairvoyance and Thoughtography. The book was criticized for a lack of scientific approach and his work disparaged by the university and his colleagues. Fukurai eventually resigned in 1913. Carrière with fake ectoplasm made from the French magazine Le Miroir. In the early 20th century the psychical researcher Albert von Schrenck-Notzing investigated the medium Eva Carrière and claimed her ectoplasm "materializations" were the result of "ideoplasty" in which the medium could form images onto ectoplasm from her mind. 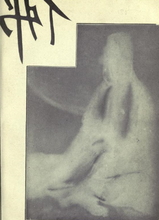 Schrenck-Notzing published the book Phenomena of Materialisation (1923) which included photographs of the ectoplasm. Critics pointed out the photographs of the ectoplasm revealed marks of magazine cut-outs, pins and a piece of string. Schrenck-Notzing admitted that on several occasions Carrière deceptively smuggled pins into the séance room. The magician Carlos María de Heredia replicated the ectoplasm of Carrière using a comb, gauze and a handkerchief. After Schrenck-Notzing discovered Carrière had taken her ectoplasm faces from the magazine he defended her by claiming she had read the magazine but her memory had recalled the images and they had materialized into the ectoplasm. Schrenck-Notzing was described as credulous. Joseph McCabe wrote "In Germany and Austria, Baron von Schrenck-Notzing is the laughing-stock of his medical colleagues." In the 1960s, it was claimed that Chicago resident Ted Serios, a hotel bellhop in his late forties, used psychokinetic powers to produce images on Polaroid instant film. Serios's psychic claims were bolstered by the endorsement of a Denver-based psychiatrist, Jule Eisenbud (1908–1999), who wrote a book, The World of Ted Serios: "Thoughtographic" Studies of an Extraordinary Mind (1967), arguing that Serios's purported psychic abilities were genuine. However, professional photographers and skeptics found that Serios was employing simple sleight of hand. According to magician and skeptic James Randi "Kiyota's Polaroid photos were apparently produced by preexposing the film, since it was noted that he made great efforts to obtain a film pack and spend time with it in private." In a 1984 television interview, Kiyota confessed to fraud. ^ a b Krauss, Rolf H. (1995). Beyond Light and Shadow: The Role of Photography in Certain Paranormal Phenomena: An Historical Survey. Munich: Nazraeli Press. p. 57. ISBN 9783923922383. ^ Lowenstein, Adam (2015). Dreaming of Cinema: Spectatorship, Surrealism, and the Age of Digital Media. Columbia University Press. pp. 124-. ISBN 9780231538480. Retrieved 6 December 2017. ^ a b Chéroux, Clément (2005). The Perfect Medium: Photography and the Occult. New Haven, Connecticut: Yale University Press. p. 155. ISBN 9780300111361. ^ "Modern psychical phenomena, recent researches and speculations". Internet Archive. 2010-07-21. Retrieved 2016-12-17. ^ a b c Nickell, Joe (2005). Camera Clues: A Handbook for Photographic Investigation. Lexington: University Press of Kentucky. p. 195. ISBN 9780813191249. ^ a b Stein, Gordon (1996). The Encyclopedia of the Paranormal (2nd ed.). Amherst, New York: Prometheus Books. p. 517. ISBN 9781573920216. ^ Brugioni, Dino A. (1999). Photo Fakery: A History of Deception and Manipulation (1st ed.). Dulles, Virginia: Brassey's. p. 160. ISBN 9781574881660. ^ a b c Carroll, Robert Todd (2003). The Skeptic's Dictionary: A Collection of Strange Beliefs, Amusing Deceptions, and Dangerous Delusions. Hoboken, New Jersey: Wiley. ISBN 9780471272427. Retrieved 11 February 2017. ^ Kristen Lacefield (1 April 2013). The Scary Screen: Media Anxiety in the Ring. Ashgate Publishing. pp. 34, 37–. ISBN 9781409476191. Retrieved 11 February 2017. Later that year Fukurai began to study another psychic, Ikuko Nagao, who possessed a talent he called "nenagraphy" or simply nensha. Fukurai coined this term from the Japanese nen, meaning "thought" or "idea," and the Greek graphein, meaning "writing" or "representation," intending it to refer to the power of inscribing images directly onto photographic plates by sheer force of will. This phenomena was known among western psychical researchers as "psychography" or "thoughtography," a practice that first emerged with the discovery of so-called "N-rays" around the turn of the century. ^ David B. Baker (13 January 2012). The Oxford Handbook of the History of Psychology: Global Perspectives. Oxford University Press. pp. 354–. ISBN 9780195366556. Retrieved 11 February 2017. ^ a b Brower, M. Brady (2010). Unruly Spirits: The Science of Psychic Phenomena in Modern France. Urbana: University of Illinois Press. p. 120. ISBN 9780252077517. ^ a b c d "Spiritism and common sense". Archive.org. 2010-07-21. Retrieved 2016-12-17. ^ McHargue, Georgess (1972). Facts, Frauds, and Phantasms: A Survey of the Spiritualist Movement. Doubleday. p. 187. ISBN 0385053053. ^ Harris, Frank (1993). Debates on the Meaning of Life, Evolution and Spiritualism. Buffalo, New York: Prometheus Books. p. 77. ISBN 9780879758288. ^ Nickell, Joe (2010). Camera Clues: a Handbook for Photographic Investigation. Lexington: University Press of Kentucky. p. 197. ISBN 0813138280. Retrieved 11 February 2017. Psychokinetic Photographs. In 1967 the world learned of a Chicago man with apparently remarkable powers: he could merely think of pictures and cause them to appear on photographic film -- a supposedly psychokinetic (PK) process called "thoughtography." The man, an often unemployed bellhop named Ted Serios, was the object of a sensational article in Life magazine and even an entire book written by Denver psychiatrist Jule Eisenbud, The World of Ted Serios. To accomplish his marvelous feat, Serios looked through a paper tube that he pressed against the camera's lens. A Polaroid model was used . . .
^ Kripal, Jeffrey J. (2011). Authors of the Impossible: The Paranormal and the Sacred. Chicago, Illinos: University of Chicago Press. p. 285. ISBN 9780226453897. Retrieved 6 December 2017. ^ Hines, Terence (2002). Pseudoscience and the paranormal (2nd ed.). Amherst, New York: Prometheus Books. p. 77. ISBN 9781573929790. ^ "'Psychic Projections' Were a Hoax - The Chronicle of Higher Education". Chronicle.com. Retrieved 2016-12-17. Anyone who knows anything about this issue knows that Mr. Serios was long ago exposed and thoroughly debunked as a fraud. This was done with absolute certainty by professional photographers Charlie Reynolds and David Eisendrath in the October 1967 issue of Popular Photography. Serios was observed, when he thought no one was looking, sticking pictures into his "gizmo," a tube he held between his head and the camera lens. That some claim he produced images without the tube, and at some distance from the camera, is easily attributed to double exposure or use of previously made exposures, followed by the fake snapping of a picture. ^ Paul Kurtz (1985). A Skeptic's Handbook of Parapsychology. Buffalo, New York: Prometheus Books. p. 348. ISBN 9780879753009. ^ "K - Encyclopedia of Claims". James Randi Educational Foundation. Retrieved 6 December 2017. ^ Randi, James (1995). An Encyclopedia of Claims, Frauds, and Hoaxes of the Occult and Supernatural (1st ed.). New York: St. Martin's Press. ISBN 0312151195. ^ Melton, J. Gordon; Shepard, Leslie (2001). Encyclopedia of Occultism and Parapsychology (PDF) (5th ed.). Detroit, Michigan: Gale Research Company. p. 865. ISBN 081039488X. Archived from the original on November 1, 2010. Randi's point was driven home in 1984 when Masuaki Kiyota, hailed as the Japanese Uri Geller, revealed in a television interview that he had faked the phenomena that had been verified by both American and Japanese researchers. Hereward Carrington. (1921). The Problems of Psychical Research. Dodd, Mead and Company. This page was last edited on 12 January 2018, at 03:50 (UTC).